There is a huge standing ovation tonight for Charlie Hunter on guitar and Scott Amendola on drums. When we enter The Electric Owl, the ambience is warm and inviting and there is a strong scent of Jazz in the air. The house is packed which is a given in this great acoustics house of fine music. In case you haven’t been here, the Electric Owl’s capacity is 350 people with well thought out seating arrangements. Charlie Hunter and Scott Amendola make their entrance on stage right on time. The mood is relaxed and this large audience becomes quiet and focused on the artists. The performance starts with the soul grabbing drumming of Scott Amendola. These two musicians play so in sync that it is a real pleasure to hear their music ebb and flow together as their eyes connect with the next progression. Hunter’s guitar seems to be part of his body as he creates amazing sounds with great ease. His playing at times is beyond words. 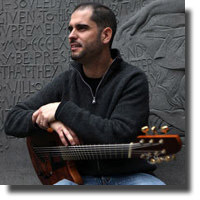 There are many patrons in the club who are members of other bands who have come to take in and learn from this incredibly talented jazz guitarist. They play complex jazz and produce unbelievable sounds. Hunter moves his fingers at an incredible speed up and down those strings and makes the audience sit in awe. He has a charismatic personality as he talks to the audience and tells of the old days visiting Vancouver and how he, a Bay area boy, couldn’t get over the array of fantastic food here. Scott Amendola must be one of the best drummers I’ve had the pleasure of hearing. The range of sounds that he produces is stunning. The Electric Owl is truly the place for great musicians to play. First of all they will be playing for a respectful audience and secondly an appreciative audience. Each time a complex piece is played, the audience applauds with admiration for what great drumming and guitar picking is all about. I’d like to mention that Hunter and Amendola were in a band called T.J. Kirk which won a Grammy nomination for their second album. The only negative on this performance is there was a tad too much vibration and when music is too loud, you don’t really hear the beauty of the music being produced. During the intermission, the piped in music was far too loud. This is a fantastic performance and “BRAVO” to Hunter and Amendola. Your playing is impressive.